Reviewed: Endless Bike Company's Bottle Opener - SSCXWCKY14 Edition! If you've ever gotten one of those plasticky bottle openers from some event that look like this, then you know what a bummer a crappy bottle opener is. 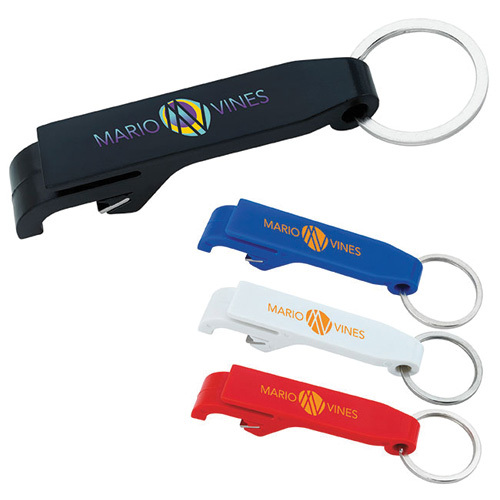 Even it it's free promo swag, there's just no excuse for that kind of trash, just like there is no excuse for being caught without a bottle opener. I've used it to open hundreds, if not thousands of bottles, and through every use cycle it remains as sturdy as ever. This design was etched by frikin' lasers! Maybe even attached to sharks' heads! This is how I generally use the bottle opener, although I'm sure there are other uses. If you're like me, you have janitor's-ring size keyring, and another doodad to stick on there is not what you need. Enter this classy little fella. At about the size of a credit card, it slides into your wallet nicely, and given its lack of compliance, will keep your dog's photo from getting bent as it too rides around in your wallet. Technical details: this is a purplish-pink anodized aluminum bottle opener. I have no idea how much it weighs. However, I will say that I find its complete lack of vertical or horizontal compliance a refreshing buck of current industry trends, as well as functional. At $7, you might be tempted to think, why should I buy such an expensive bottle opener, when I can get free ones all over the place? Having been burned before by cheap freebie bottle openers, I have learned my lesson and like to say, "Buy once, cry once." You pay for quality folks, especially made in the USA quality. This is the Chris King of bottle openers. It's the standard to which all bottle openers should aspire. It will certainly outlast you.